As the creator of Healthy Highway, Wendy built the program through the use of educationally sound concepts, innovative lessons and classroom materials that utilize fun and imaginative traffic metaphors. The goal was to equip children with the tools, skills and beliefs they needed to embrace healthy choices throughout life. After watching her student’s enthusiasm for the program in her physical education classes as well as the success rate, Wendy made the decision to share it with others. This was after a 30 year teaching career. Healthy Highway has motivated thousands of school-aged children to change their eating habits and add more physical activity into their daily lives. 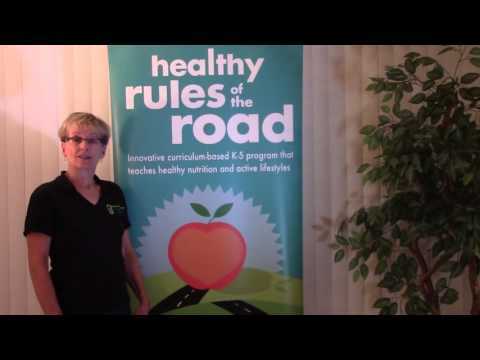 Rules of the Road program was the catalyst for the development of Healthy Rules of the Road, an expansion of the first program, incorporating “fuel-injected” nutrition knowledge. Both programs are still in use today in schools across the country. Well respected by her peers, Wendy has been recognized for her indomitable will to help children and families develop healthy lifestyles. She is currently working on 2 initiatives: Holy Childhood: a non-profit agency working to enrich the lives of people with intellectual and developmental disabilities. All 120 families have received the Riding with Rev Family Pack to support the Healthy Highway program being taught in the school. Great partnership! Oswego County 3 year action plan: one-of-a-kind community-driven commitment where all nine school districts have been trained in the Healthy Highway program, and are now incorporating the program in each of their 24 elementary schools. For the past two years Healthy Highway has participated in one of the first-ever interactive programs with a police department to talk about the importance for both officers and children to make healthy lifestyle choices. Wendy trained several officers in the concepts of the program. In turn, these officers visited a local elementary school to talk directly to the students about choices they make. The police department challenged the entire school to make 500 healthy choices in a week. At the end of the week the officers served lunch to all the students. This program has expanded from one school to three schools. A recognized expert in her field, Wendy has presented at numerous state and national conferences across the country. One of her highest honors was being a featured exhibitor at the Alliance for a Healthier Generation’s celebration of the top 100 Healthiest Schools in the country. This is where schools from across the country come to Washington, D.C. to be honored for their dedication to creating a healthy school environment. Wendy decided to go directly to the families by writing a book specifically for families - a fun guide for busy families wanting to make healthy choices. Her goal is to provide a fun, educational road map encouraging families to come together as a team in heading down the highway to healthy choices. This has led to a new goal: expanding the traffic themed concepts to include decisions in all aspects of your life. By applying the “red light/green light” concept, decisions now move from “traffic jams” to action steps to move forward. The more we use this metaphor in our decision making situations, the more momentum will be gained in maintaining good health. How exciting to start with our children, to help them become accountable for their own healthy choices so they then become empowered to help others. Wendy has been the recipient of a number of accolades and awards. . In 2015, Wendy received two awards, the Special Olympics Healthy Communities Partner of Excellence Award and the Greece Chamber of Commerce's Annual Community Awards Health Award. This was the very first health award presented by the Chamber. In 2012 she received the Amazing Person Retiree Award presented by NYSAHPERD. In 2003, she was named Teacher of the Week and, in 2004, she was a finalist for the New York State Teacher of the Year, as well as the Dole 5 A Day Creative Teacher of the Year awards. After retiring in 2007, Wendy has been very involved with getting the Healthy Highway program out across the country. In March 2012, Healthy Highway received national recognition and was featured as a “How Cool is That?” organization on Rachael Ray’s Yum-O website and in the Yum-O Newsletter. The “The How Cool Is That? One of her biggest honors was being asked to be a sponsor of the Alliance for a Healthier Generation conference in Washington, D.C. in 2013. This conference was to celebrate the top 250 healthiest schools in the nation. Bill Clinton is the founder of this organization. I’m Rev, the Healthy Highway mascot. I’ve been on the Healthy Highway for ten years with my owner, Wendy Cooper. Just like Wendy, I like to teach and have fun sharing my healthy choices with children and families. My tail starts wagging very fast when I hear stories from families that have started making more “green light” choices! I know my “engine” runs really well! I am very proud to say I wrote the Healthy Highway Pledge: “I promise to make ONE healthy choice every day.” Insert picture of pledge magnet “We promise to make one healthy choice every day”.